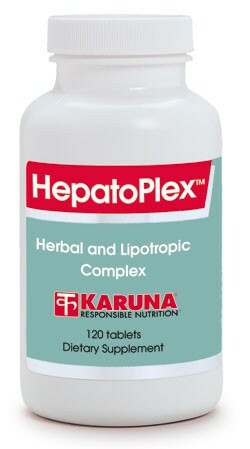 HepatoPlex contains a complex of botanic and nutritional components that support gallbladder and liver function. The compounds in dandelion root, fumitory, barberry root and artichoke leaf extract facilitate bile flow. Betaine and methionine are methyl donors that are required by hepatic detoxification mechanisms. The flavonoids from milk thistle exert a number of useful actions supporting the liver. Dandelion, barberry and fumitory are traditional botanical medicines possessing choleretic effects that promote optimal biliary function (Arzneimittelforschung 1959;9:376-8; Med Prom SSSR 1964;18:59-60; Z Allgemeinmed 1971;47:1819-20). Artichoke leaf extract has been shown in human clinical studies to have choleretic (bile flow-enhancing) and cholesterol-regulating effects, and also possesses hepatoprotective activity according to in vitro research (Phytomedicine 1997;4:370-8; Wien Med Wochenschr 1999;149:241-7; Arzneimittelforschung 2000;50:260-5). 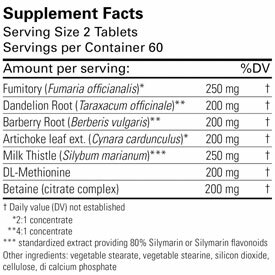 Silymarin is a mixture of potent bioflavonoids that support normal repair mechanisms in the liver (Agency Healthcare Res Qual: Number 21, September 2000). Silymarin contains liver-specific antioxidant properties, directly scavenging free radicals and increasing levels of hepatoprotective glutathione (Tokai J Exp Clin Med 1986;11:121-34). DL-methionine protects against hepatotoxicity from xenobiotics such as certain environmental toxins, according to animal research (Toxicol Lett 1981;8:147-52). Betaine, a natural methyl donor, reduces the effects of excessive fat storage in the liver (Arzneimittelforschung 2000;50:722-7). Suggested use for adults: Two tablets twice daily, away from meals, or as directed.